Proteomics is a very powerful and promising approach to study proteins involved in various biological processes. New analytical techniques along with the growing availability of genomic sequence information make it possible to systematically analyze in parallel numerous proteins in a cell or tissue expressed under a certain condition. 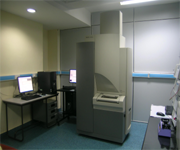 Proteomics facility at the National Institute of Plant Genome Research uses mass spectrometry as the key technology for the qualitative characterization of proteins. The facility, funded by the Department of Biotechnology, Govt. of India, started in 2007 with the aim to initiate, coordinate and facilitate proteomics research activities. 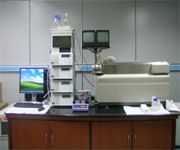 The facility has several equipments and experience for proteomics activities at its disposal. The service of the facility is available to internal and external users. 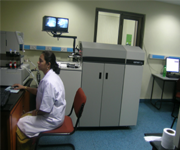 The activities of this facility are mainly focused on the identification of proteins. Protein samples supplied as SDS-PAGE gel bands and stained with MS-compatible dye or in solution, are subjected to tryptic digestion and peptides extracted according to standard protocols. Peptides are analyzed by electrospray ionization time-of-flight mass spectrometry (LC/MS/TOF) coupled online with Tempo nano MDLC or MALDI-TOF-TOF. Peptides are identified by searching the peak list generated by Analyst or 4000 Series Explorer software against the MASCOT (http://www.matrixscience.com) search engine using the GPS Explorer or Protein Pilot software.